Happy Friday! This week seemed to fly by, and I can't believe it's already the weekend (not that I'm complaining...) I hope that you all had a fantastic, quick week and are ready to relax! 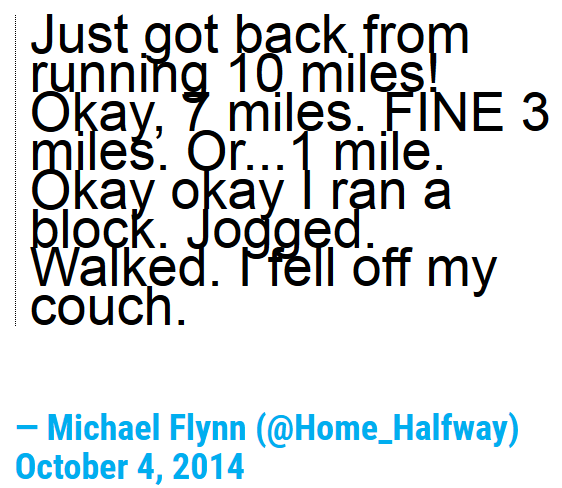 I would also like to sincerely thank all of you for commenting on my half marathon plan yesterday. You all have such great suggestions and I will tweak my plan accordingly. The last thing I want is to end up injured or burnt out, so thank you so much for all of your input!! Isn't the blogging community the best? Today I thought it would be fun to mix things up and share a few articles and fun posts that I found this week. I always love reading Link Love posts and wanted to share a few of my favorites from the week! Please be sure to share anything you're loving to read, and share your thoughts on what I shared! Not only are these people way faster than me, but they're also way funnier. I loved these tweets, which are all so relateable! Hilarious! I think we've all been there for most of these situations, and this made me laugh out loud at work! Even if you haven't seen the show you'll love this. Interesting read! Like most, I jumped on the acai bowl band wagon. A friend who studies environmental science in Sweden mentioned the fact that it wasn't the best habit to start, so I did some research. Really interesting article breaking down the impact of shipping these "superfoods" to America. Most surprising static I found: Americans comprise just 5% of the world’s population, and yet use more than 40% of its resources. 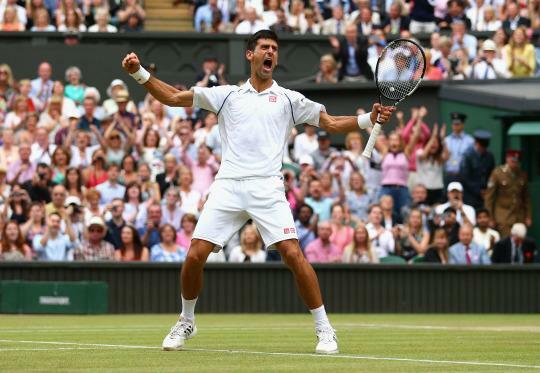 Djokovic is one of my favorite tennis players, and this was a great read. Now I want to read his entire book! I also noticed a huge difference in my performance when I eliminate gluten from my diet during training. Although I'll never be a world-class athlete, I'll take any advantage I can! One of my favorite shows from this summer is renewed for a second season! Can't wait for it to start, but in the mean time check out some behind-the-scenes info. I was a little disappointed with the performances last week, then this week was blown away by every single performance. Everyone danced so well! I really can't pick out a favorite routine, but my favorite dancers still stand at Jim for Team Stage and Jaja for Team Street. I have absolutely no shame in the fact that this is my favorite show of all time (that might be a bit of an exaggeration). I still watch old cycles constantly, thanks to Hulu, and am so excited for the new season to begin!! Based on episode 1, my favorites are Nyle and Mame. Another one of my favorite shows! I haven't been able to watch the season premier yet (no cable problems) but I'm so excited! Who else is in love with Tim Gunn!? He is definitely one of those people I would invite to a fantasy dinner party (along with Amy Schumer and Hines Ward of course). I think he would bring the most thoughtful hostess gift ever and tell me I look fabulous. Love him!! I'm really happy that there aren't as many singers getting through to the live shows this season. In past years, I've enjoyed more of the variety acts that you can't see on other shows (cough American Idol, The Voice, X Factor..) so I'm so excited to see all of these interesting acts moving forward! I was a little sad that Alex Boye didn't make it through. I've been a big fan of his ever since his amazing Let it Go cover came out, so I was disappointed that his performance was lackluster. What's better than a Taylor Swift song? A TS song being sung by an incredible singer and accompanied by the harp! I've probably made the point clear by now that any song I hear with a harp will appear in my top songs of the week, but seriously this one is so good. Emilie is the singer, and named her harp Ogden. Can't wait for her upcoming album to be released! This song came on during a track workouts this week, and it immediately made me run a little faster. It's such a fun song with a really fast beat. I love listening to Major Lazer when I run because all of their stuff is so different and fun to listen to! Makes me want to dance! I've been going through a major country moment this summer, and this song has been on rotation constantly. I love Big and Rich's music and this is no exception. I think that George Ezra may be my new favorite singer. I fell in love with the song Budapest last year, and now I've become obsessed with his entire album. His voice is so amazing, and his songs are the perfect background music for work, and also great for easy/slow runs. If you haven't heard his other songs, listen now!! Yes, I've got someone to follow the new ANTM cycle with! Nyle is my favorite male too. I really like Ava out the females.Very interesting about the acai bowls! YAY!!! I like the girls a lot more this season than the guys. They all seem to take better pictures, and some of the guys just seem like jerks! There was some America's Top Model event in DC on Wednesday. Not sure if it was just a party or casting call. Listening to Emilie and Ogden now - so chill! That's so cool!! I wonder what it could be for? I drop some bucks on iTunes every Friday because of you! But I seriously love it. There is so much music out there and it feels like I can never get to listening to everything. I love your recommendations. 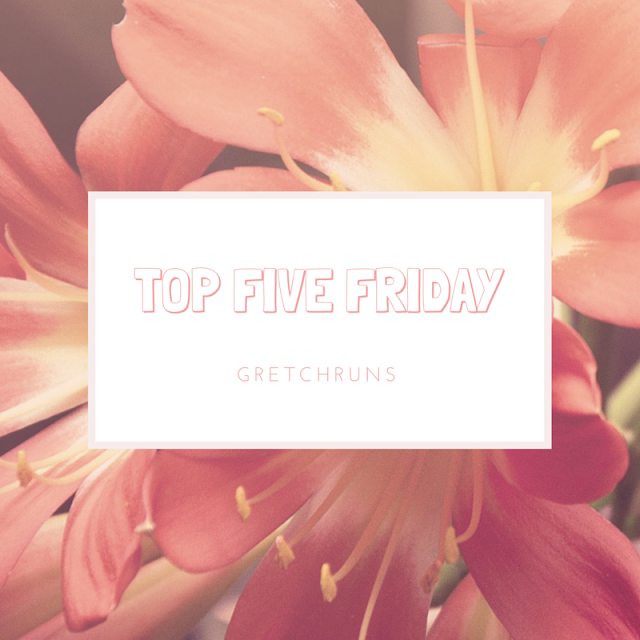 Happy Friday, Gretchen! I'm glad you like him too! I'm so glad I found his album on Amazon music. And I totally agree on the weekend..if it could just last a little longer than usual I would be happy. I love UnReal and am so glad it got picked up for a second season!! Those tweets made me laugh! Thanks for sharing. 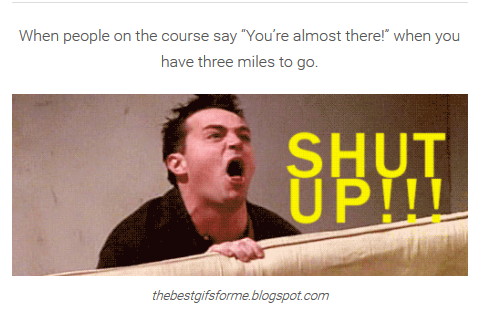 That is the worst when someone tells you that you are almost done and you still have several miles to go. I love the running quote. You just described my life. AH! You are better at keeping me up to date on pop culture than my US Weekly subscription! I have not been watching TV this summer but if Project Runway is back on I might have to get back into it. Love that show! I'm also loving every song by Major Lazer so I need to check out the new one! And yes..pretty please go try on a pair of Express jeans this weekend! They are really great and come in different lengths too. (For some reason I imagine you are tall?? No?) I'll be watching on snapchat to see if you do! LOL. Haha I'm glad that I can help Gina! I'll definitely be checking out those jeans. They look great online, so I'll send you some fitting room pics and you can help me choose. It's funny you think I'm tall..my pictures must be very deceitful because I'm a shortie and always have to order the short pant length! I'm about 5'3, maybe 5'4. i'm obsessed with unreal - especially because i'm friend's with one of the actors. such a great show! I've heard so many good things about Unreal!! I need to watch it. Have a great weekend! I like Major Lazer! I love "Lean On" :) Happy Friday! I love that song as well! So catchy. I hate when I hear you are almost there when you are most certainly not. Don't be saying that unless the finish line is right in front of me. Exactly!! I heard that some races have outlawed this unless you're cheering near the finish line! Not sure how they can actually make sure people aren't doing it, but I wish every race had that rule!